VEVA owns this 1912 Detroit Electric car which was manufactured by the Anderson Car company in Detroit. It was purchased new in 1912 at a cost which exceeded a large house of the day. It was owned by Mrs. French, a doctor's wife who in her later years, lived at the Empress Hotel in Victoria. It was kept charged in the hotel garage by the staff and was delivered to the hotel entrance whenever she phoned for the car. 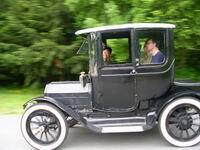 It was driven regularly until 1950 and was a featured historic car at Vancouver's Expo 86. The front and rear compartments were filled with the optional Nickel-Iron batteries which gave it a range of close to 100 miles. The still fully-operational batteries finally had to be replaced in the late 1980s due to the Bakelite cases starting to leak. 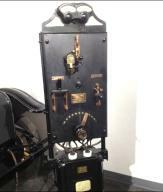 Today, the car is owned and maintained by the Vancouver Electric Vehicle Association and is a permanent featured exhibit at the Stave Falls BC Hydro Powerhouse Museum near Mission. Coincidentally, that historic 55 megawatt powerhouse was also built in 1912 and only recently replaced by a 90 megawatt hydro plant. The car is currently powered by 96 volts consisting of 16 lead acid batteries, each 6 volts. The range with the lead acid batteries is 60-80 kilometers. In place of the original large wall-mounted charger are two smart 48 volt chargers operating off 120 volts, manufactured and donated by Delta-Q Technologies of Burnaby, BC. Steering is via a tiller bar operated by the right hand and speed is controlled by the left hand. There are two brake pedals for redundancy and to increase braking effectiveness. As various speeds are selected, a rotary switch style controller places two 48 volt battery banks in parallel or series and also selects various windings on the motor. For starting off and low-speed operation, there is a large power resistor in series at 48 volts. The motor has never been serviced and resembles closely elevator motors of the day, many of which are still in daily operation. In place of a horn is a DC-operated bell on the levers. The wheels are wooden-spoked wagon wheels and there is seating for 3 people. The car body is made from rust-proof sheet aluminum with a steel and wooden chassis. 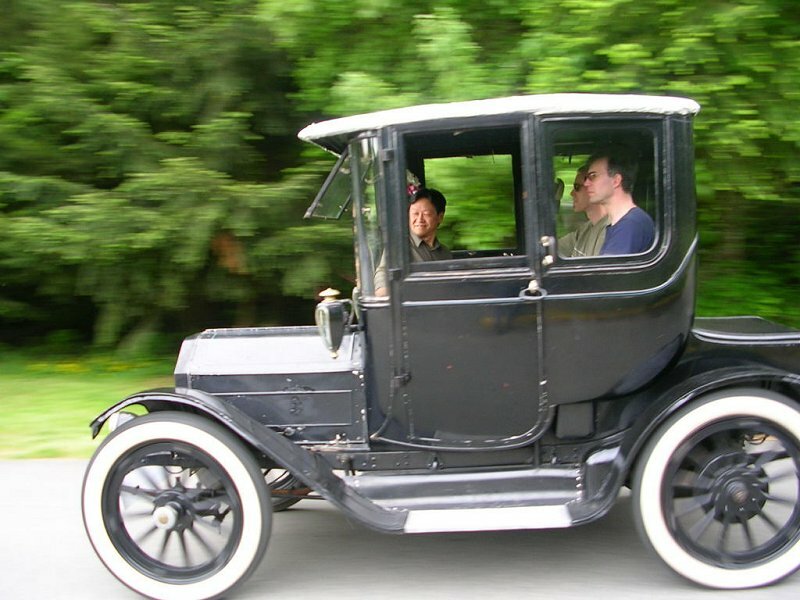 Although the car was delivered in 1912, it is actually 1913 model. See PDF of first two images. Model number was 31, Type 13B, Two-Passenger Coupe with Third Person Seat. Interestingly, this vehicle was only offered in Blue, Brewster Green, and Maroon - with other colours extra. From the report taken from the Anderson records, the delivery date was 1912, but the type refers to the model year. A 1936 letter from the Edison company to Dr. French acknowledges the longevity of the car's nickel-iron based Edison cells. Indeed, these cells performed well in the car for 75 years.